« How far can you ride a bike in 24 hours? A number of nice recumbent bikes and trikes are featured at Vite Bikes, including my current go fast bike, the Encore, made by John and Jacquie Schlitter and shown below. This is a type of recumbent called a high racer. If you are an aggressive road bike rider, high racers or MBB bents might be for you. They can be fast, but there is a learning curve. As far as climbing goes, it totally depends on the rider. For level or near level roads, these bikes give an old guy a technology edge due to aerodymanics. If a person wants to ride with road biking friends, a high racer is one to consider. It creates a bit of a wind shadow at a height that is useful for a drafting road bike. If a road biker is riding side by side to a fast recumbent, he is using 20% more energy. Nice. The Encore below is ridden by John Schlitter, creator of lots of innovative recumbent designs as well as owner of substantial ultra endurance wins. John’s wife Jacquie also has tons of racing credentials, and we hope to see an Encore ridden by Jacquie in the RAAM at some point. Low racer, such as the Performer, ridden below by Barbara Buatois, First Place Finisher in 2010 RAAM. Low racers are for the lone wolf rider. They can be fast, and offer no draft assistance to a following road bike. They can climb as well as a road bike if ridden by a fit rider. Ms. Buatois has a facebook page here, and a website here. 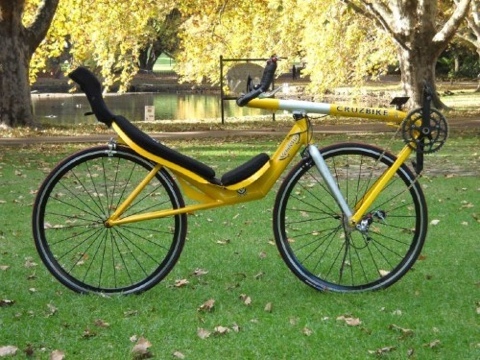 Long wheelbase recumbents are a design such as this proven design Tour Easy made by Easy Racers. A 4 man team of great riders on the Gold Rush with a fairing posted great times in the 1989 RAAM, but went off route too many times to win the race. A bike similar to this, the F40, with a full fabric fairing, won the 1989 RAAM, in the 4 man team category. Tadpole trike from makers such as Catrike (below), Trident, ICE, and Terratrike. Tadpoles can be pretty fast, faster than a mountain bike, similar to a road bike ridden by a casual road bike, not a racer. For fun riding, with little risk of falling down, all weather commuting, and no hassle start and stopping, these are great and a blast to ride. Delta trikes such as those made by Hase Bikes. They are a little higher than most tadpole trikes, so they are easier to get in and out of. If your balance is questionable, or you just really don’t want to fall down on a bike, consider a trike. These are high performance trikes. Velomobile These are just crazy fast down hill and on level ground. They are faster than any bike or recumbent. MBB (moving bottom bracket) such as those made by Cruzbike, ridden below by multiple record holder Maria Parker. Maria’s records include setting a course record in the Hoodoo 500, fastest recorded time in Assault on Mt. Mitchell race, course record in UMCA 12 hour ride (257 miles in 12 hours), course record Sebring 12 hours drafting race, 261 miles, world record UMCA 200 mile record in 9 hrs 17 min, course record for females, Michigan 24 hour Challenge, 2014 RAAM 50+ female record…. and many many more. All recumbents are made for comfort, with back support, neutral neck position, and no pressure on wrists, hands, shoulders and neck. They often have a neck rest. Some recumbents are fast, and all human powered speed records are held by recumbents. The current human powered speed record is about 83 mph (running start, no drafting, no pacing, on level ground, no wind assist, solo rider over a 200 m distance). Some excellent brands made in the U.S. include Rans, Encore, Cruzbike, Lightning, Easy Racers, Catrike, Terratrike, and Bacchetta. 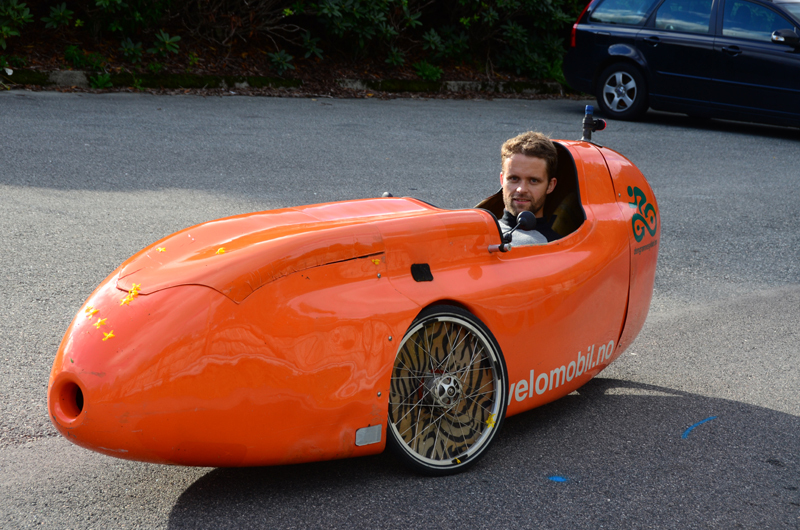 In addition to those described, we have built a direct front wheel drive recumbent. On the website http://www.kervelo-bike.com, you’ll see how it rolls.